Comfort is experienced, not perceived. An office chair layered in bulky foam padding may look comfortable, but it also looks… well… bulky. Technology has helped make everything slimmer, trimmer, and more streamlined—from TVs to mobile phones. 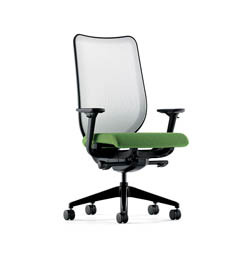 Nucleus brings the same sophisticated, high-tech aesthetic to work chairs without sacrificing comfort. Its unique construction distributes weight evenly across the seat and eliminates pressure points, delivering comfort without the bulk. Available with or without arms. Chair Base available in Standard Black or Polished Aluminum. Available in illra-stretch M4 back or NEW! Fully upholstered back.